The main elements that form the rhythmic structure of a jazz track are the bass and drums. The basic drum kit used for jazz is the same as for any other kind of acoustic music, most basically featuring snare, kick, toms, hi-hat and crash/ride cymbals. However, you'll rarely hear these drums played in the same way as a straight 4/4 rock or pop beat. A hi-hat and/or ride is often used to provide the bulk of the rhythmic element, with a swung or syncopated feel. The kick, snare and toms are used mostly for embellishments. In the step-by-step below we show you how to emulate a basic jazz beat using MIDI programming. For more on recreating the feel of jazz in your DAW, pick up the September issue of Computer Music (CM194). Step 1: The jazz rhythm section is often driven by a characteristic swung ride cymbal pattern. We're using the standard NY Avatar kit in Superior Drummer 2 with the Brushes option enabled, but you could use any similar sampled drum kit. We program the above repeating riff on the ride cymbal in eighth-notes. Step 2: Swing and shuffle are both types of groove, and your DAW should have a feature to help you inject this into the rhythm. We use Cubase's Swing function in the Quantize panel. As we increase the swing, the grid changes as shown, displacing the off-beat eighth notes. We increase it to 100%, select all the notes, then hit the Quantize button (or tap Q). Step 3: You should now have a recognisably 'jazzy' ride pattern. 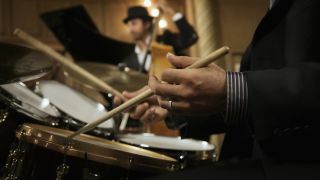 In rock and dance genres, it's common to emphasise beats 2 and 4 with the snare drum; in jazz, the drummer usually plays these beats with their left foot on the hi-hat pedal instead. Program a hi-hat pedal sound (note that this is not the same as a struck, "closed" hi-hat sound!) on beats 2 and 4. Step 4: Let's add in a kick and a snare. Unlike in most other 4/4 styles, jazz kicks and snares don't always play squarely on the beat. We create a new track and program a kick and snare as shown. In Cubase, our notes snap immediately to swung positions as we've still got the Swing slider turned up; if your DAW doesn't work like this, re-quantise your kick and snare. Step 5: At the moment, our drums are swinging well, but all the hits are at maximum velocity, making the drums sound too aggressive for jazz. We bring them down to around 100 to start with. There should also be plenty of dynamic variation, often with some emphasis on beats 2, so we adjust each note's velocity by hand, resulting in the above. Step 6: The timing is also too rigid, so we use Cubase's Random Quantise function to move all the notes randomly by up to 8 ticks - this is a great trick that also works to break up the 'machine gun' effect of rock and metal drums! Finally, let's add some ghost notes on the snare drum - we disable snapping for this and place very low velocity notes at strategic points.